Hamilton made a lot of calendar models in the 1970s with manual winding, automatic and even electronic movements. The majority of models featured ETA-based movements of various calibers. I recently happened upon a watch that I have been unable to identify in the catalogs but based on the model number I would say it's from circa 1975 since there are other model numbers in the same range. My project watch is actually quite large and measures almost 36mm across. It has a stainless steel case that could use a good polish. The dial is very interesting and features a unique font for the numerals on a parchment-like textured dial. The model number of this watch is 836012-3. The -3 indicates the case is stainless steel. I gather from the movement inside that the 836 represents the caliber of the movement. 012 may mean it's the 12th model to feature the 836. Although it looks like the case might be a one-piece design, the case back actually pops off. The inside of the case back is unremarkable and just says Hamilton Watch Co Swiss. The 836 is a fairly obscure movement and shows up around the 1975/76 time frame. It looks like most of the other 1970's ETA movements and it looks a lot like today's ETA grades too. Although the case back doesn't have any watchmaker's marks inside, someone has been inside at least once, as there's a fingerprint on the reflector ring under the dial. The dial-side of the main plate is different than any other vintage Hamilton I've come across. The set bridge actually goes over the hour wheel and extends toward the left side of the movement. Only one screw holds the set bridge in place. The date wheel index is powered by a horse shoe-shaped spring. That's a new feature for me too. This movement features a quick-set date setting complication with a three-pointed gear near the stem that advances the date wheel. Here's a better shot of the horse shoe spring and index lever. I don't want to lose this, that's for sure. This side of the movement is stripped for parts for now. I'll get the balance jewels later. One screw holds the oscillating weight in place. The two screws hold the framework for it. At this point the movement is starting to look like every other ETA movement I've come across. However, it's its interesting to note it has far fewer bridge screws. The barrel bridge is held in place with two screws and the train bridge only has one! Even the pallet fork bridge only has a single screw. Everything is cleaned and dried, even the o-ring that goes inside the case back. The basic movement is reassembled and ticking away with good motion. Looks like it's running fine. A slight tweak to the regulator and the hair spring stud will improve the beat rate and beat error. There - running 18 seconds fast per day with a beat error of 0.6ms. Notice this movement has a beat rate of 21,600 beats per hour. The dial goes back onto the reassembled movement. I'll advance the time until the date changes and then install the hands at midnight. Two case screws secure the movement inside the case. Now I can press the case back onto bezel and seal the watch back up. Before I close up the watch, I need to install the o-ring inside the cover. I bone-colored genuine alligator strap is a perfect complement to the parchment-colored dial. With a new crystal and polished case, this watch looks awesome in my opinion. It's large enough to even qualify for modern standards... not bad for a 40+ year old watch. As I close in on the last 400 or so models I haven't documented yet, I am going to have a harder and harder time of finding them. Some I will never find, as there are only a couple known examples of the rarest models. Others are not quite as scarce but will still be tough to find (and afford). I did recently land an ultra-rare watch. It's a 1962 Sherwood T. The Sherwood series from the early 1960's was little more than a set of prototypes as Hamilton explored the potential of using exotic wood veneers for dials. 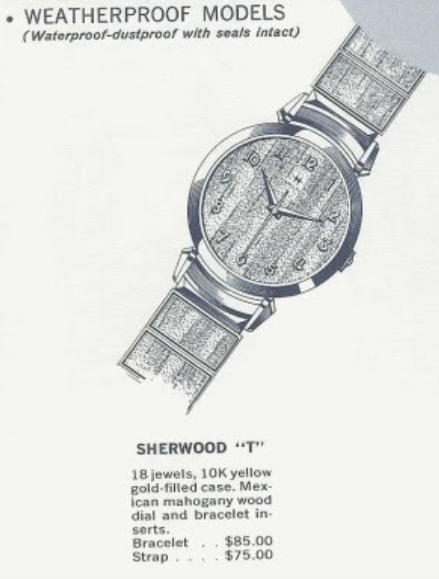 The Sherwood T was only available for a single year. I have never seen another one for sale so I took the plunge when I saw my project watch listed for sale. If the Sherwood T looks familiar it's probably because it shares the case and overall design with the Rodney - which is a very common but popular model from the 1950's and '60s. The Sherwood T is powered by a Lancaster-made 18 jewel 735 movement. The dial features solid gold numerals applied to Mexican mahogany wood. 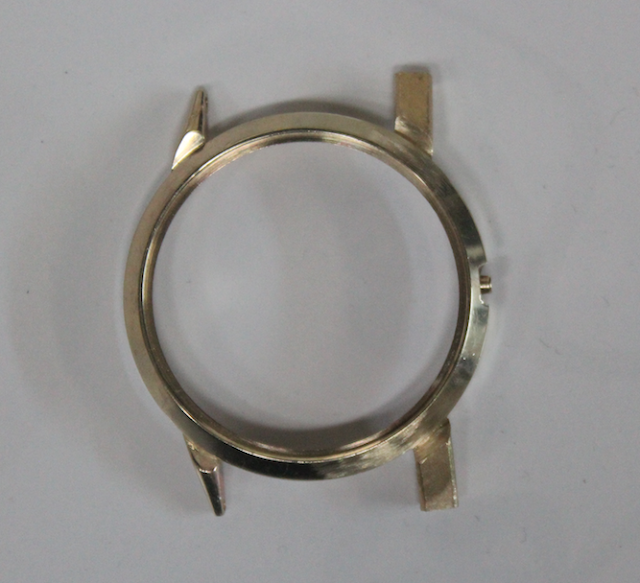 The case is 10K yellow gold filled. You could buy it on a strap or on a bracelet with matching wood inserts. My project watch came with it's original box, which is always a cool find. The Speidel bracelet is not original and will have to go. Although my photo is a little blurry, you can tell the watch is overdue for a good cleaning. The dial appears to be in good shape. Hamilton found that wood dials were very problematic, so the model line was short lived. From the back, this watch looks exactly like a Rodney. The 735 movement is a shock-jeweled version of the 748 movement introduced in the late 1940s. This close up of the dial shows that it's in remarkably good shape - which is great because I doubt it can be refinished. Everything gets disassembled and thoroughly cleaned. Oddly, most of the Rodneys I have restored (and it's been about a dozen) have all used 30.6mm crystals. This bezel requires a 30.0mm crystal. The 8/0 748, 735 or 736 is probably the hardest manual winding movement to reassemble. It requires a light touch, lots of patience and, usually, a few choice cuss words. I might speed it up a smidgen but I'll leave the bear error where it is. As long as it's under 3ms I don't tend to adjust it - as it's a good way to goof up a working balance. Although the case is in great shape, the crown on this watch is very worn and very hard to wind. I happen to have a perfect genuine Hamilton replacement. You should never wind your watch with it on your wrist. Take it off to wind it. When you wind it on your wrist you will apply uneven pressure and that can bend the stem like in the shot below. The stem on top came from my project watch. Notice it's bent. So I have to replace the stem in order to install the new crown. I'm not sure what color strap originally came on the Sherwood T but I chose a deep brown alligator strap for my watch. I think a light chestnut brown color would be a great choice too. With a lightly polished case, new crystal and crown, this watch looks factory-fresh. My light tent makes it hard to capture the sparkle of this watch but the gold hands and numerals really pop when the light hits them right. As a general rule I've tried to not post the same model twice, although I have occasionally broken it when I had a little more to say on the subject. However, for the most part I've managed over the past 650+ posts to stick with something new to show you. I'm about 2/3rds of the way toward the goal of documenting every vintage Hamilton mechanical model made. So with that in mind, I thought I'd share with you a recent project that really shows you what someone who knows what they're doing can do (and it's not me... ha ha!). The subject watch is a 1959 Thin-o-matic T-300 that was in serious need of some TLC. 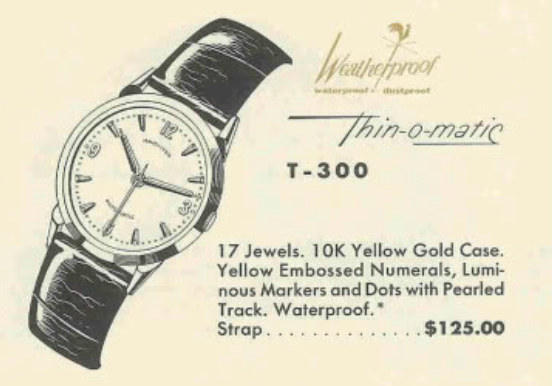 The T-300 was one of the first Thin-o-matic models introduced and as you might surmise by the 300-series number, it was the first Thin-o-matic in solid 10K gold. I did a detailed post on this model in 2017. As I indicated above, I was recently introduced to a T-300 that needed some serious attention. In most cases (pardon the pun) this watch would likely have been scrapped. As you can see in the photo below, not only was it missing it's crown, it was missing two of the lugs! It's unfortunate that the missing lugs are on the same side of the watch, as sometimes you can at least use the watch as a pendant if there are two lugs on the same side. But this watch was figuratively, "screwed". The backstory of the project is like most vintage watches... it was somebody's grandfather's and as such, it was priceless to them. It had to be saved. I suspect the reason two of the lugs were missing was because the case could not be opened and they broke off during an attempt. One of the remaining lugs is also bent inward, indicating this watch is lucky it's not missing three limbs. The owner took it to a couple of places to try to open it before he sent it to me but without success. The back was seized on tight as a drum. Without a crown, it was quite possible the inside of the watch was a wreck too - although it appeared to tick, which is always a good sign. Anyway, I tried unsuccessfully to open it as well and even applied penetrating oil for a couple of days with no luck. The case back was already scraped up by other peoples' attempts and I didn't want to do any more damage. Even applying penetrating oil worried me - "what if it gets on the dial? ", I thought. My last resort was to epoxy a large nut to the back of the watch and then use a conventional wrench to unscrew the joined assembly. That's called "going all-in", as removing the nut would be near impossible if I wasn't successful. Newtonian physics would indicate that applying a great force to the nut would require an equal and opposite great force to restrain the case - otherwise the watch would just spin. I secured the case as best I could in my vice and then lubricated the case back with beads of sweat that dripped from my brow as I attempted to apply force. Voila! The case slowly gave way and opened to reveal a fairly nice-looking Hamilton 666 micro rotor movement inside. You may be wondering at this point how I got the nut off the case back. That's straightforward - I simply boiled it in water until the epoxy gave way. Of course, I still had some pretty serious issues to resolve but the case is looking nice and clean now. I can tell by the mark inside the back that the rotor has been rubbing the case. I'll worry about that later. First things first. A little polishing and the case back is free of most of the signs of abuse, other than one major gouge. The threads on the case are in good shape... a little wavy in some spots but the back screws on nicely nonetheless. At this point in the project the real magic happened. With the owner's approval, I sent the case to the very talented Lance Heck in Laguna Beach, California and asked him to fashion and attach two new lugs in 10K gold. A couple of weeks later the case was returned and all I had to do was overhaul the movement, install a new crown and case gasket, install a new crystal, and fit a very nice genuine croc strap. So I guess I had to work a little magic of my own too. This watch turned out fantastic and I would challenge anyone to tell me which lugs, if any, are the replacements (assuming you didn't see the photos above). You may be wondering how much a project like this would cost. Let's just say not as much as a new solid 10K Hamilton watch would cost. A better question is how much is restoring your grandfather's heirloom worth to you? With that in mind, this project was a great deal. I think this project also shows that where there's a will, there's a way. If a Hamilton watch is important to you, don't let anyone tell you "It's not worth fixing". It wasn't unusual in the 1920's and 1930's for men's models to have multiple dial and case material choices. In fact, some models came in gold filled and solid gold in colors like white, yellow or green gold. You might even find materials like sterling silver and platinum sneaking in too. Then you could add the options of black inlaid enamel, applied gold figures and luminous dial options to the mix. A single model could have 20+ or more possible permutations. The amount of variety within a specific model decreased over the years but that was made up for by a greater number of model designs being offered. However, some models still came with options. 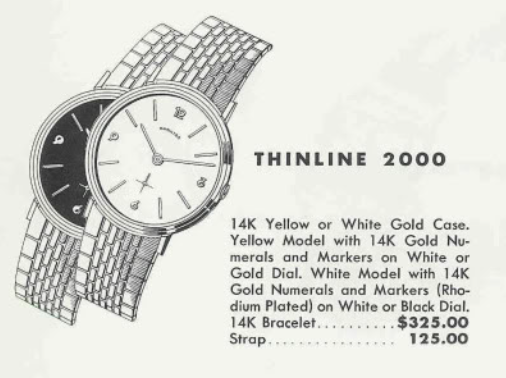 For example, the 1960 Thinline 2000 came in both white or yellow gold and you had the choice of white or gold-colored dial with the yellow case or a white or black dial with the white gold case. 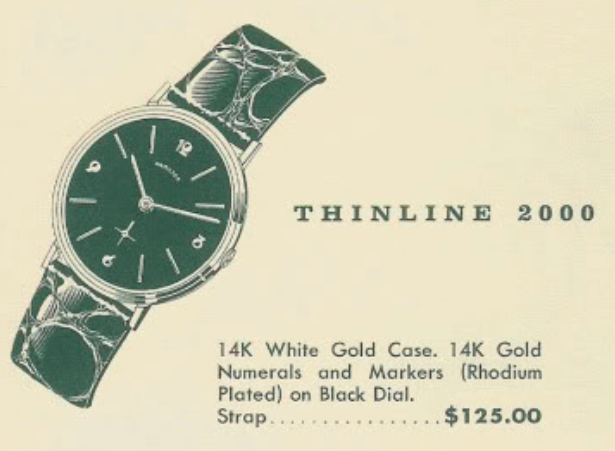 In 1961 the Thinline 2000 offering was reduced to the 14K white gold case only and the only available dial was black. That means if you see a yellow gold Thinline 2000 it must be a 1960 version. One reason for the lack of variety in the 1961 model year was the phase out of the movements used in the original Thinline models and the introduction of Buren-based calibers that would be used later in the 1960s. I don't know if the Thinline 2000 is a "rare watch" but I saw a few for sale at the same time. Maybe it was just a coincidence. In any event, I landed one that appeared to be in good shape, albeit with a little lug wear thanks to the metal bracelet. The back of this watch has a presentation from 1962. This doesn't look like factory engraving though and it probably came from a local jeweler who had the watch in inventory. You can tell from the lip on the back of the case (above) that this is a two-piece case and the back pops off. With the bezel and crystal out of the way, it appears that the dial is in very good overall condition with just a smidgen of crud around the outside perimeter. Behind the dial is 17 jewel 676 movement. This Swiss-made movement is based on an Aurore Villeret movement. Aurore was an ebauche-maker from same family as other makers in the ESA Swiss trust. The inside of case back is clearly marked Hamilton W. Co. You should look for this sort of mark when identifying a solid gold cased model - as without this stamp the watch is likely not an authentic model (1930's models excluded). While things are being cleaned in the ultrasonic I will measure the beat up crystal so I can pick out a replacement. 29.4mm is the current diameter. Since the watch has a very low profile I will try a PK-style crystal. 29.3mm may be too small but I'll give it a shot before going larger. Everything is cleaned and dried. The most challenging aspects of this movement are the balance jewels. They are about half the size of the jewel setting that the ETA movements use so they are extra-easy to lose. The reassembled movement is ticking away with a nice motion. Time to see what the timer thinks of it. Not too bad at all. I'll leave it running a little fast for the time being but the rest of the specs look great. A new crystal and a fresh alligator strap bring this 58 year old watch back to showroom condition. This is a great looking watch... it's very sleek but it's also a good size. 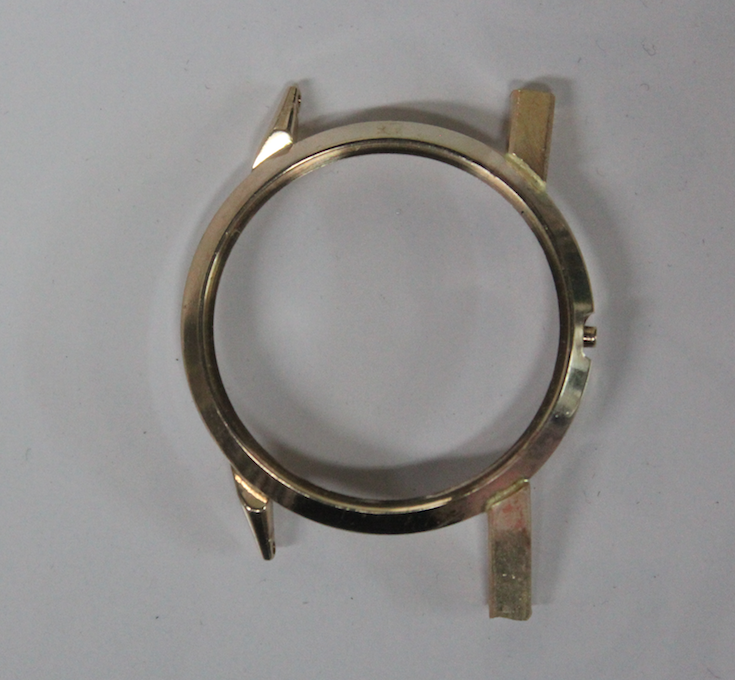 It measures about 34mm wide, which is a large size for a vintage watch.